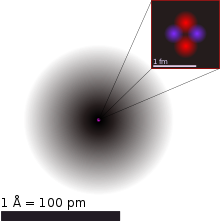 The atom is the smallest unit that defines the chemical elements and their isotopes. Omar Nelson Bradley Speech on Armistice Day (1948). In Robert G. Torricelli, Quotations for Public Speakers (2002), 237. We can still use the objectifying language of classical physics to make statements about observable facts. For instance, we can say that a photographic plate has been blackened, or that cloud droplets have formed. But we can say nothing about the atoms themselves. And what predictions we base on such findings depend on the way we pose our experimental question, and here the observer has freedom of choice. Naturally, it still makes no difference whether the observer is a man, an animal, or a piece of apparatus, but it is no longer possible to make predictions without reference to the observer or the means of observation. δοκεῖ δὲ αὐτῶι τάδε· ἀρχὰς εἶναι τῶν ὅλων ἀτόμους καὶ κενόν, τὰ δ'ἀλλα πάντα νενομίσθαι [δοξάζεσθαι]. Now his principal doctrines were these. That atoms and the vacuum were the beginning of the universe; and that everything else existed only in opinion. Variant translation: The first principles of the universe are atoms and empty space; everything else is merely thought to exist. If the motion to be discussed here can actually be observed, together with the laws it is expected to obey, then classical thermodynamics can no longer be viewed as applying to regions that can be distinguished even with a microscope, and an exact determination of actual atomic sizes becomes possible. On the other hand, if the prediction of this motion were to be proved wrong, this fact would provide a far-reaching argument against the molecular-kinetic conception of heat. Albert Einstein, "On the Motion of Small Particles Suspended in Liquids at Rest Required by the Molecular-Kinetic Theory of Heat"
Albert Einstein, Telegram (24 May 1946) sent to prominent Americans. Quoted in New York Times (25 May 1946). In Robert Andrews Famous Lines: a Columbia Dictionary of Familiar Quotations (1997), 340. Variations exist due to different translations from the original German. … Several of Thomson’s colleagues thought he was joking when he argued that the electron was smaller than the atom and was a constituent of every atom; to many scientists, the idea that there could exist matter smaller than the atom was inconceivable. Yet he was proved right. If, in some cataclysm, all of scientific knowledge were to be destroyed, and only one sentence passed on to the next generations of creatures, what statement would contain the most information in the fewest words? I believe it is the atomic hypothesis (or the atomic fact, or whatever you wish to call it) that all things are made of atoms—little particles that move around in perpetual motion, attracting each other when they are a little distance apart, but repelling upon being squeezed into one another. In that one sentence, you will see, there is an enormous amount of information about the world, if just a little imagination and thinking are applied. Another way to remember their size is this: if an apple is magnified to the size of the earth, then the atoms in the apple are approximately the size of the original apple. "But what if we could see them?" "We shall never be able to see atoms themselves, only their effects." "That's a poor excuse of an answer. For the same remark a pplies to things in general. In the case of a cat, too, all you can see is the reflection of light rays, i.e., the effects of the cat, and not the cat itself. And when you stroke its fur, the situation is much the same!" And in the corner by the window gable was a shelf with some books, and some from a circulating library. She looked. There were books about Bolshevist Russia, books of travel, a volume about the atom and the electron, another about the composition of the earth’s core, and the causes of earthquakes: then a few novels: then three books on India. So! He was a reader after all. A man concerned about the state of his soul will not usually be much helped by thinking about the spheres or the structure of the atom. I don't believe that atoms exist! Supplanted both demons and gods by the atoms, which last to this hour. With the rarest of nectar to drink, and blue fields of nothing to sway. There is nothing but atoms and void, all else is mere whims out of date! To compass some petty promotion in nebulous kingdoms of mist? Must the fear of the gods be dispelled, but by words, and their wonderful play. How he clothes them with force as a garment, those small incompressible spheres! May combine to express an opinion to every one of them new). Till you all pass a resolution which takes every man by surprise. Enables our race to inherit the thoughts of beasts, fishes, and worms. But how shall we honour the vista of ancestors now in our view? The atomists next let us praise, Epicurus, Lucretius, and all. To form that remarkable structure it pleased him to call—his mind. Have melted in infinite azure—in English, till all is blue. As for the atoms, they have been in far worse rows before they became naturalised in my brain, but they forget the days before, etc. At any rate the atoms are a very tough lot, and can stand a great deal of knocking about, and it is strange to find a number of them combining to form a man of feeling. In your letter you apply the word imponderable to a molecule. Don't do that again. It may also be worth knowing that the aether cannot be molecular. If it were, it would be a gas, and a pint of it would have the same properties as regards heat, etc., as a pint of air, except that it would not be so heavy. Henry Moseley, Letter to Margery Moseley (2 Feb 1913). In J. L. Heilbron (ed. ), H. G. J. Moseley: The Life and Letters of an English Physicist 1887-1915 (1974), 201. As far as materialistic atomism goes: this is one of the most well-refuted things in existence. In Europe these days, nobody in the scholarly community is likely to be so unscholarly as to attach any real significance to it, except as a handy household tool (that is, as an abbreviated figure of speech). Clifford G. Shull, Nobel Banquet Speech (10 Dec 1994), in Tore Frängsmyr (ed. ), Les Prix Nobel. The Nobel Prizes 1994 (1995). Answer given by an anonymous pupil to a question on atomic theory, as reported by Sir Henry Enfield Roscoe, Reports of the British Association for the Advancement of Science, 57th report, 1887, 7. … A particle, on the other hand, has discrete properties which it carries with it. And so the remarkable thing was the discovery, in investigations of various atomic phenomena, of an apparent paradox. The history of science shows that sharp definitions lead to trouble. Dogmatism in science is usually mistaken, because the conviction of certainty expresses a psychological compulsion, never any truly compelling reasons or facts. When a view attains wide popularity and seems obviously beyond question, its decline has usually begun or will begin very soon. In 1892 W. W. Rouse Ball of Trinity College, Cambridge, who was well informed on competent opinion—J. J. Thomson was also at Trinity—wrote: "The popular view is that every atom of any particular kind is a minute indivisible article possessing definite qualities, everlasting in its properties, and infinitely hard." Rouse Ball wisely added descriptions of two rival atomic doctrines: Boscovich's point centres, and another based on twists in an elastic solid aether. Four years later the hard everlasting atom began its rapid exit from physics. The matter which we suppose to be the main constituent of the universe is built out of small self-contained building-blocks, the chemical atoms. It cannot be repeated too often that the word "atom" is nowadays detached from any of the old philosophical speculations: we know precisely that the atoms with which we are dealing are in no sense the simplest conceivable components of the universe. On the contrary, a number of phenomena, especially in the area of spectroscopy, lead to the conclusion that atoms are very complicated structures. So far as modern science is concerned, we have to abandon completely the idea that by going into the realm of the small we shall reach the ultimate foundation of the universe. I believe we can abandon this idea without any regret. The universe is infinite in all directions, not only above us in the large but also below us in the small. If we start from our human scale of existence and explore the content of the universe further and further, we finally arrive, both in the large and in the small, at misty distances where first our senses and then even our concepts fail us. This page was last edited on 29 January 2017, at 19:38.